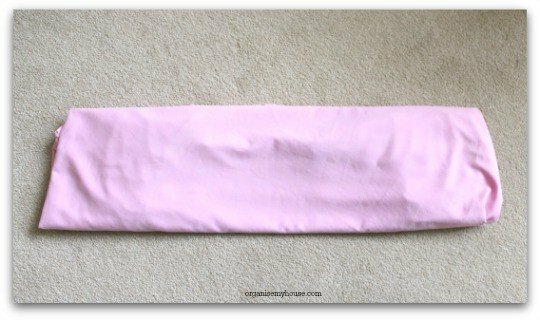 HOW TO FOLD A FITTED SHEET – THE EASY WAY! 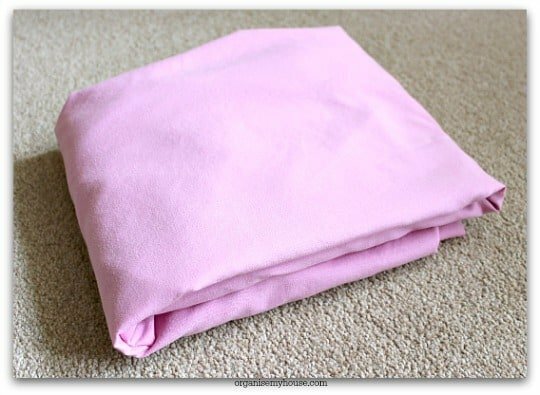 I was recently asked by a reader how to fold a fitted sheet so that they stop looking so messed up when in the cupboard – and frankly, this is something that I have tried many methods before I came across the one that works best for me, so I thought a step by step guide was in order today, and I really hope this helps you too. Do your fitted sheets look like this too?! Not only is it less than pretty to look at, it makes the sheet creased, and takes up much more room to store than anything else in the linen cupboard – it makes me want to change to flat sheets….. So let’s get started on what I do to make things easier (i.e. neater and tidier!). TIP – This method is easiest when you have a flat surface like a table, a bed or a floor to work on. So you can see exactly what’s what, lay the sheet out onto a flat surface, with the crinkled edges visible, like in the picture below. Please note that I am using a single sheet for the pictures as it’s easier to photograph! It’s worth a closeup here of a seam – so you can see what I’m talking about in the next step! 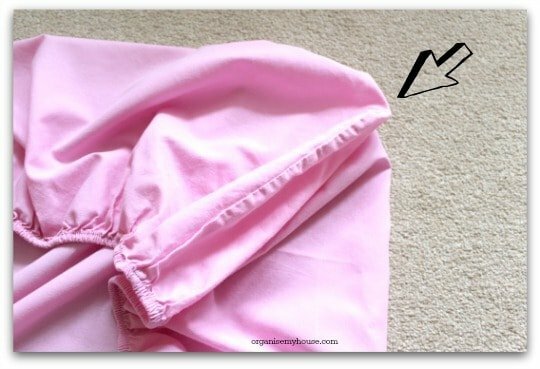 – there are 4 seams, one in each corner, and these are what will help you to fold the sheet more easily, so make sure you can clearly see each one before you move on! Take the 2 corners that are at the bottom and fold up and into the top 2 corners so that the seams align. TIP – some people like to do this lengthways, others do top to bottom, it’s totally whats easiest for you, I can’t see much of a difference either way and believe me I’ve tried everything! You now have a much more rectangular shaped sheet to work from, as the fitted sides are now enclosed more. 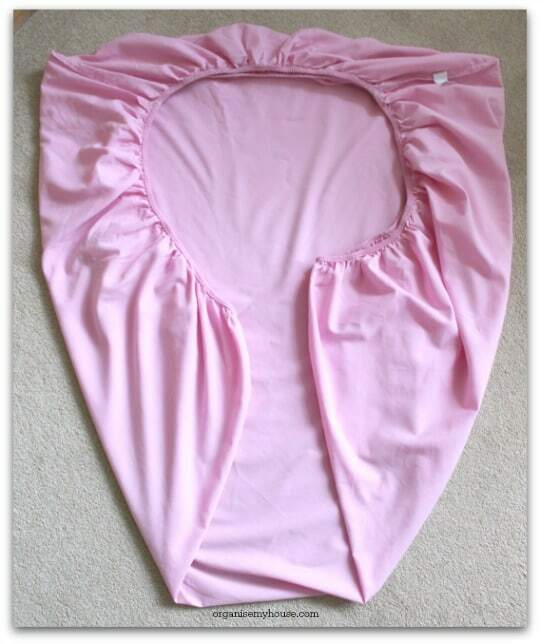 This step is to fold the sheet so that you get a long rectangular shape to work with at the end. Depending on the size of your sheet, you may just be able to do a couple of folds from the bottom to the top, or you can bring the top third down and the bottom third up to ensure nice straight lines (it depends on how square you want your final result to be….). The perfect way to fold your sheet! – or at least this is the perfect way for me – it’s not too much of a hassle, and gives a nice crisp finish. 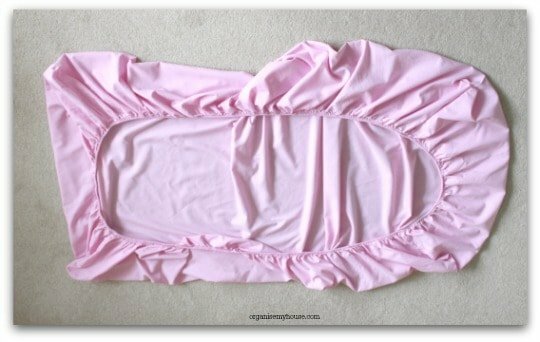 WANT AN ALTERNATIVE WAY TO FOLD A FITTED SHEET? I have included it as you may prefer doing it this way, and I want anything you organise to be organised how you find it easier – as that’s the whole point! Now, you may be asking why bother with this, as it takes more time than just rolling it up or folding as best you can – but you will save tonnes of time when it comes to finding what you need in your cupboard – it will all be much neater and easier to grab – not to mention quicker! 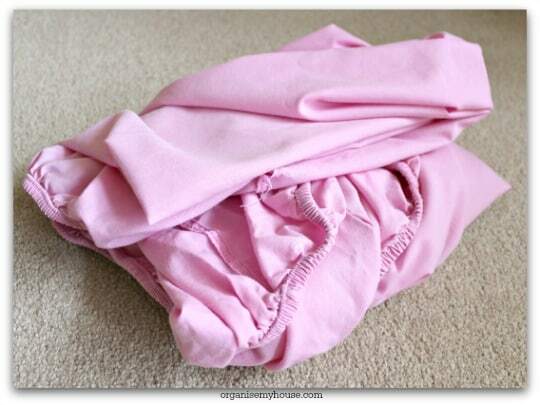 There you have it – the easy way to fold a fitted sheet! It works well for me, and I really hope it does the same for you too. P.S. If you’re ready to tackle more than just the sheets in your linen cupboard, then you’ll most definitely want to check THIS POST out next! This is so much easier than all the folding over and holding the sheet. I tried that way and never got it right. 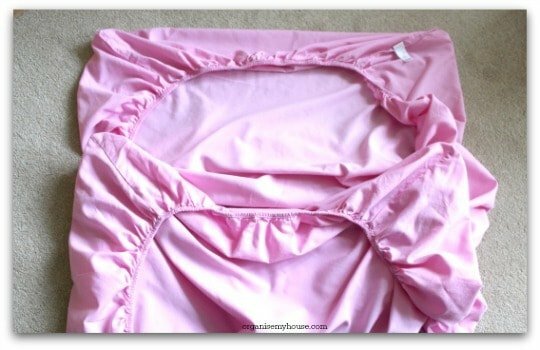 Thanks for sharing with those of us who are fitted sheet challenged. 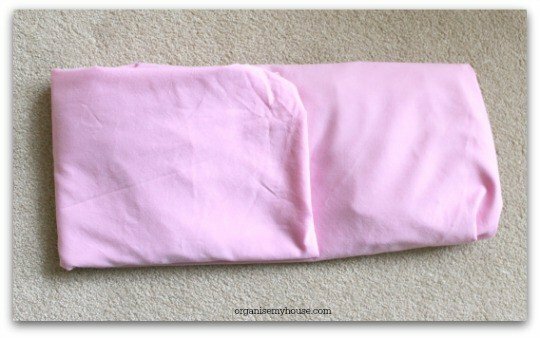 I love this way to fold fitted sheets! 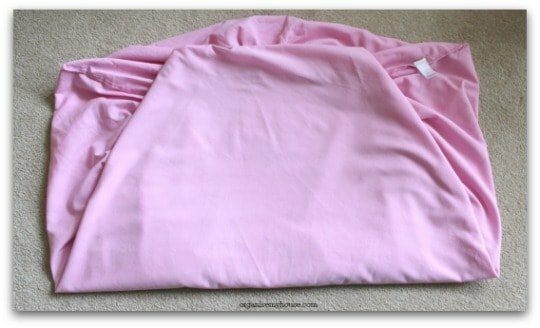 I keep my spare bedding – sheet, fitted sheet, pillow cases and duvet cover- all together in my linen cupboard by putting them into a pillowcase of the set.